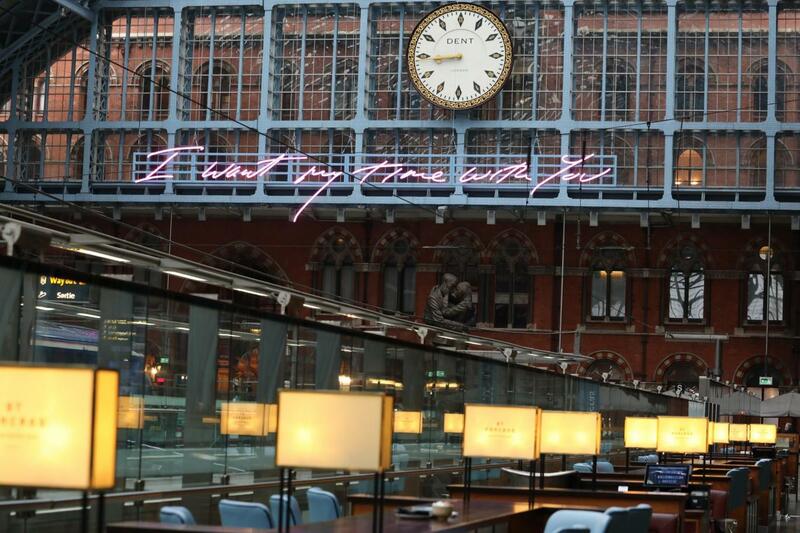 Tracey Emin unveiled her latest work today – a 20 metre-long greeting to commuters arriving at St Pancras station. The light installation that reads ‘I Want My Time With You’ has been hung on wires from the building’s Grade I listed roof above its grand terrace. The Brexit-opposing artist also said she wanted to make “a statement that reaches out to everybody from Europe arriving in to London”. It is the sixth year of the Terrace Wires Commission at the station, which is the London hub for the Eurostar, and follows work by artists including Cornelia Parker and Conrad Shawcross. The work was commissioned by HS1 Ltd, which owns the station, and the Royal Academy of Arts whose artistic director Tim Marlow who said Emin was “one of the most important and influential artists in the world”.